Knocking your wedding venue and date off your to-do list will officially mark the beginning of your wedding planning festivities. I shoot weddings all over including the Caribbean, however being a Northern Ontario boy at heart – there’s something special about shooting right here in my backyard of Muskoka that naturally feels like home. Rocks, trees, water and the amazing wedding venues that blend right in. The perfect backdrop for outdoor weddings that serve as mini destination weddings for your guests. So to help you newly engaged couples, I’ve put together this list of the best Muskoka wedding venues to fuel your wedding planning. These are in no particular order. See some of these venues play a cameo in a few behind the scenes wedding videos here. They flew all the way from England to have a Trillium Resort wedding in the heart of Muskoka. Nestled in the backwoods of Muskoka between Bracebridge and Huntsville you’ll find Trillium Resort. It’s home to 6kms of hiking trails, waterfall, natural rock wall, wood-fired Finnish sauna, outdoor pool & hot tub, tennis court, fitness centre, mountain bikes, canoes, kayaks, peddle boats, cross-country skiing, snowshoeing, snowmobiling and skating. Trillium has 17 cottages & chalets for a total of 23 bedrooms. Your wedding party has exclusive use of the resort for the duration of the wedding. You get the destination wedding experience having everyone on site that whole weekend. I shoot here often and am always blown away with their grounds, food and team. Robert, Milli and the entire team are top-shelf! Read more about Trillium Resort. Pro Tip #1: I highly recommend you and your girls get ready in the spa the morning of your wedding. You can have hair and makeup done there along with putting your dress on etc. The Trillium Spa is beautiful, extremely spacious and has plenty of beautiful photo opportunities. As for the gentlemen, I suggest having them get ready in the room above reception right inside the main lodge. Pro Tip #2: Trillium is an intimate location with friends and family staying right there with you all weekend. Plan activities to get people socializing Friday night when everyone arrives ie. bonfire, cannonball competition in the pool, boat races and for the winter enjoy some skating, showshoeing, cross-country skiing etc. Built in 1852 and located in Severn Township, just outside of Orillia the country home is surrounded by established perennial gardens, sweeping lawns and water features. Beyond the manicured gardens is a backdrop of country fields and woodlands. If your wedding plans include a church ceremony, Northbrook is the perfect location for your reception and photos to be taken. Contact Laurie at Northbrook, she’s just the sweetest! Learn more about weddings at Northbrook Farm. Gorgeous views of manicured lawns cut right out of the Muskoka hillside! Stay in a stunning, modern yet Muskoka-ish villa, home, or loft located beside the beautiful Doug Carrick designed 18-hole golf course. At the Clifftop Clubhouse you can play and relax – swim at the infinity pool, pamper yourself at the spa, and dine together. Your wedding guests can stay in the on-site villas or the hotels in the town of Gravenhurst just a minute down the road. Lori and her team do an amazing job with their wedding groups – it’s a must-see Muskoka wedding venue. 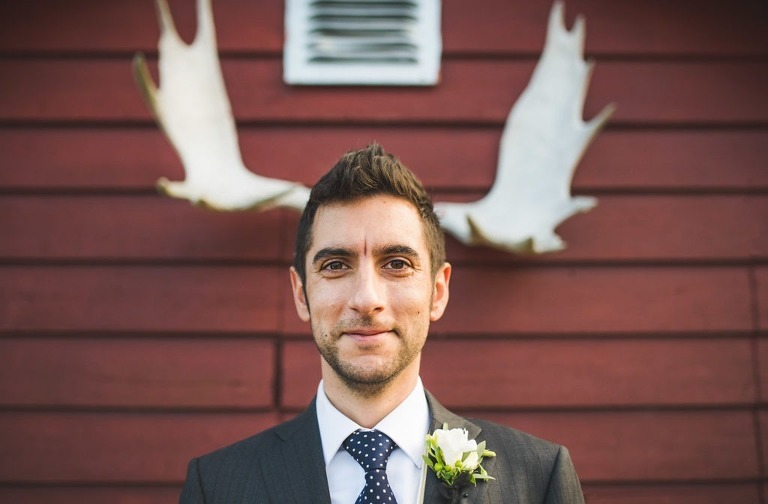 Check out one of my recent weddings at Muskoka Bay Club here. Nestled among towering century-old pines at the very edge of Muskoka’s sparkling Lake Joseph, Sherwood Inn is a unique Muskoka retreat. 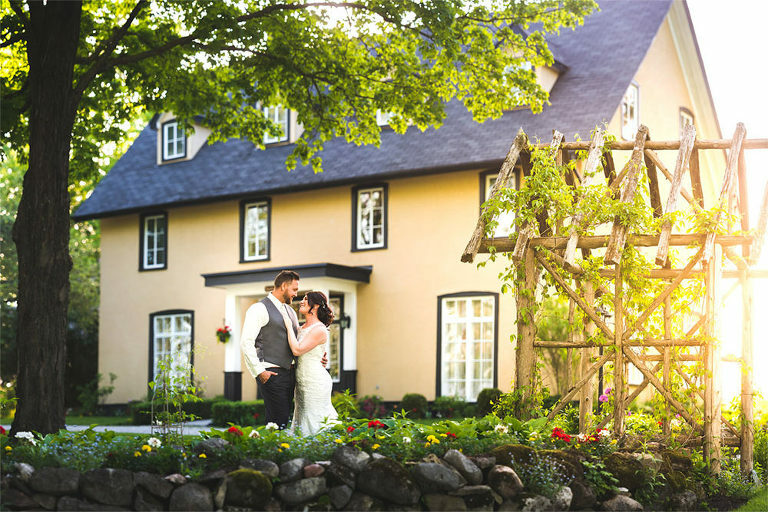 Sherwood Inn is open for weddings and offers a variety of locations – both inside and out – for the ceremony and reception. As an option, the entire resort can book be booked exclusively for the wedding – turning the celebration into a mini-destination wedding getaway for your friends and family. Check out one of my recent Sherwood Inn weddings. Wedding ceremony on the dock at Severn Lodge. 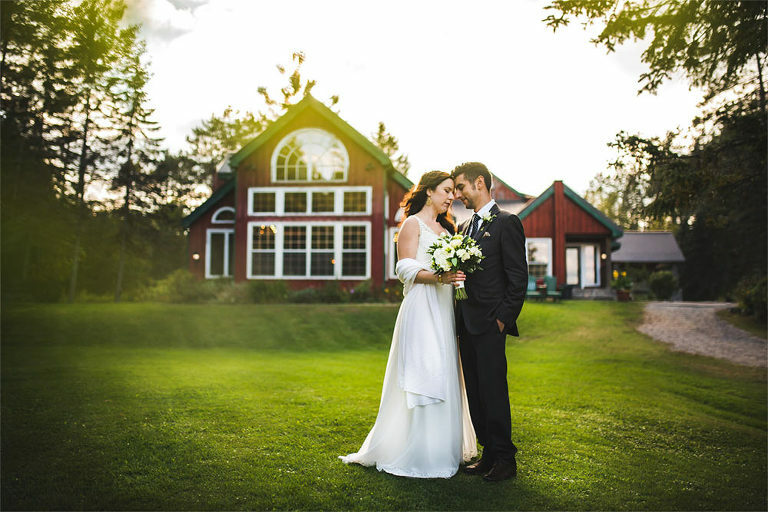 Severn Lodge has been hosting rustic Muskoka weddings for nearly a century. It’s located in the heart of Muskoka’s Georgian Bay lake district and is nestled along the picturesque shores of Gloucester Pool, part of the historic Trent Severn Waterway. The resort boasts over 2000 feet of shoreline and is surrounded by hundreds of acres of woodlands. They host weddings during the months of May, June, September and October. Your guests can choose a one or two night resort getaway package including waterfront accommodations, country fresh breakfast each morning, use of most resort recreation amenities, baggage handling, and parking. See a recent Severn Lodge wedding of mine. Huntsville’s Deerhurst Resort is located deep in Muskoka along the edge of Algonquin Park. It was one of National Geographic Traveler Magazine’s 2012 “Best of the World” recommended places to visit. Deerhurst offers intimate wedding ceremony options like the beach as well as elegant ballroom receptions. The resort boasts a wide range of activities for your guests like golf , boating, treetop treks, horseback riding, skiing, sleigh rides, skating and dog-sledding. There’s plenty of room for all of your guests to stay right there with you at the resort. Here are a few shots from a recent wedding at Deerhurst. Tip: Leave extra time for photos, this is a very large resort so allow time for moving about. The Victorian style Windermere House is a historic resort and hotel located in Windermere, Ontario in Muskoka. It’s known as The Lady of the Lakes and was built in 1870 originally as a boarding house, and overlooks Lake Rosseau. The House is a popular place for locals and tourists who visit during the summer months. It hosts cottages, 18-hole golf course, outdoor pool, tennis court, playground, church, marina, and a beach. 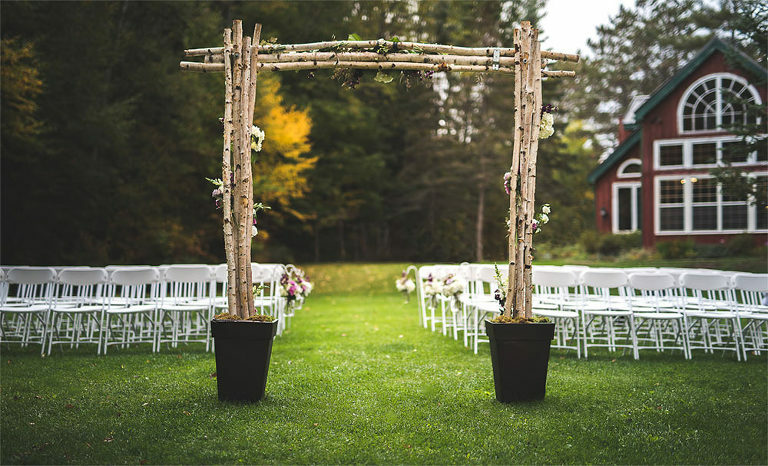 At Arowhon Pines, you’ll find an Muskoka escape with just enough rough edges to be genuinely Canadian yet just enough cozy accommodation to provide the peace, relaxation and comfort you and your wedding guests will love. A small, summer resort nestled inside Algonquin Park, it’s a place where life becomes less complicated. Shaped naturally by the hills, lakes and streams of the surrounding wilderness, here you’ll enjoy simple pleasures- savory, fresh food in a beautifully natural setting and a warm friendly welcome. See a recent wedding of mine from Arowhon Pines. Set on a granite bluff overlooking tranquil Lake Rosseau is where you’ll find JW Marriott The Rosseau Muskoka Resort & Spa. Only two and a half hours north of Toronto, this exquisite resort offers a luxury retreat experience that sets it apart from ordinary hotel accommodations. Guests can enjoy Muskoka in whatever way suits them best – a swim in the year-round pool, a round of golf even a guided hike under the stars. For wedding receptions, there’s a 6,400 square foot pillar-free ballroom and a seasonal Lakeview Lawn and Rooftop Terrace.